An exceptional balcony which dates back to the 18th century shows its restored image to locals and visitors in Camaguey colonial section, recently proclaimed UNESCO World Heritage Site. This outdoor architectonic element, covered and projected is a quite visible spot in the city's eldest historic center, a relic that has been declared National Monument. The repair of the facade of this old house closed the first stage of a restoring program that has been conducted by the Office of the Historian of the City (OHCC). 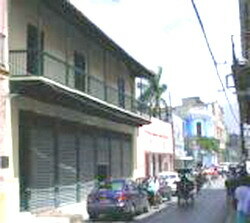 The two-storey building, located near the Antonio Maceo Plaza and one block away from the former Square of Arms, exhibits the constructive boom that lived the Spanish settlement of Puerto Principe during the 18th century. This restoration program also includes repairing a section of the roof, replace the damaged walls and change the flooring of the second story, engineer Yanelys Pérez told press.